It’s 7:10pm, and we’re racing our way through the utter blackness that is the backwoods of Chester County at night, our car swerving through tight corners, over single lane bridges, and past sleepy farms and darkened houses lit only by windowsill candles. The first course at Talula’s Table will be served in 20 minutes, and we’re running a little late. I pray that the deer that are so prevalent in these woods would stay far from the road tonight. Something about us must have earned the favor of the food gods that evening, because our trip to Kennett Square was accomplished in record time, shaving at least ten minutes off of the typical ride. Most of the businesses in this small downtown area close early, so finding parking was no challenge, and soon we were shuffling hurriedly through the cold night and flying through the doors of the shop with minutes to spare, a crinkled brown paper bag of wines in tow. Tuesday night brought together friends, neighbors, coworkers, and a handful of people we had never had the fortune of knowing prior to Saturday. Given a little more than a week to pull together a dining party, and having had a few cancellations, we were concerned about making the minimum 8 person quota for the reservation by the time the weekend was upon us. Eventually, we turned to the wonders of the Internet, posting our call-to-arms to a couple of food-related threads and forums – which were well-received, to say the least. In short order, we had the opposite dilemma, having rocketed past twelve attendees, up to fourteen, and were relieved when Talula’s Table allowed us the additional two seats. 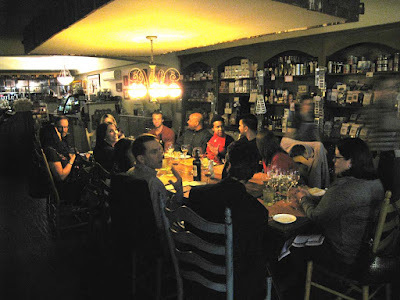 We arrived at Talula’s Table at around 7:20pm to find that everyone had already settled in around the table. Aimee Olexy greeted me warmly and took the bottles of wine from me, and we made the rounds, making it a point to introduce ourselves to the three people that we had never met before. We yet had a few minutes before the dinner service started, so I had an opportunity to chat with folks and take in the room for a bit. Besides, I needed to walk around to shake the mid-November cold off of me. The store had taken on a completely different character for the dinner hour – I had gotten accustomed to the bustling marketplace that occupies the space from 7am to 7pm, bristling with regulars getting their daily coffee and office professionals picking up prepared foods and freshly baked loaves of bread for dinner. Now, at 7:20 in the evening, none of those people were here – it was just the fourteen of us, the waitstaff, and the kitchen. The store, normally brightly lit by sunlight streaming through the front windows, was dark except for a warm glow emanating from the single chandelier suspended above the table – the lights of the cold cases, and of the cheese counter, were turned off. It gave you the sense, almost, that you were in a place where you shouldn’t be, but yet getting away with it – and that was a very strange and wonderful feeling. The table had already been set with placemats, utensils, and several wine glasses for each guest – a nice touch, and a nod to the respect for differences among varietals. Water glasses were filled, and would remain filled throughout the evening, thanks to the attentive yet unintrusive waitstaff. For each dish that would emerge from the back room, a member of the staff would take the time to introduce the presentation, which was a nice touch. Shortly after 7:30, the door to the kitchen swung wide, the conversation at the table quieted, and the first course was presented. The first course was a pitch-perfect demonstration of contrasting textures and flavors. 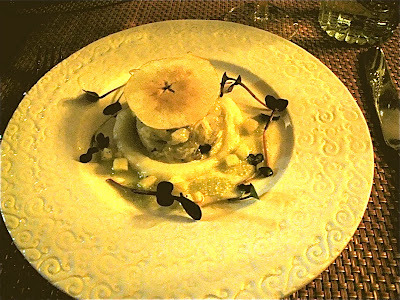 The fluke, topped with a crisp, paper-thin dried apple slice that shattered under your fork, was ringed by a pale cauliflower puree, and the plate was accented with small cubes of apple nestled into a mixture of delicate pomegranate foam and green roe. 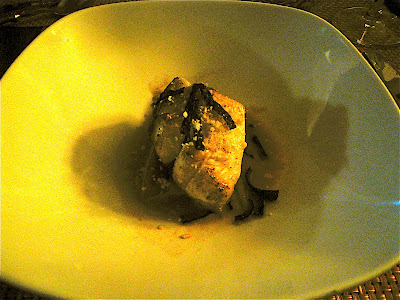 The fluke itself was mild, fresh and clean tasting in the unassertive way that white-fleshed fish can be, pairing very well with the similarly mild taste of the pureed cauliflower. The fluke barely held together, and flaked easily at the merest suggestion of a utensil. But then, a layer of sweetness arrived in my mouth with the introduction of the apple and pomegranate foam, which was then further contrasted with the crunch and oceanic saltiness of the roe. It’s definitely an eat-everything-together kind of course. The kitchen continued the seafood theme into the second course. Take a good look at the lump of red crab on this plate, and know that this was the singularly best crab I have tasted in my lifetime, in this or any other country. It almost does a disservice to the ravioli, because the quality and taste of the crabmeat overwhelms everything else on the plate. 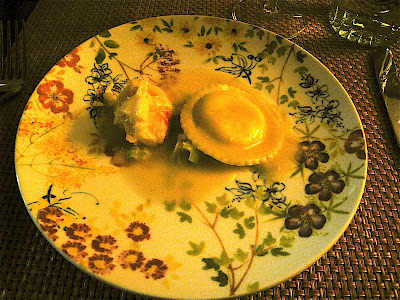 The ravioli was a pocket of pasta filled with oozing ricotta, bathed in butter. I would have preferred a thinner, softer ravioli, so bear in mind that this pasta was a bit firmer than I am accustomed, but very good nonetheless. The crabmeat – oh the crabmeat – was a nice firm knuckle of crab that had the purest, most definitive crab flavor ever. Well sourced, perfectly cooked, and plainly served, as all seafood should be. It was at this point that I switched from the white wine that I had been enjoying from the start of the evening to red, in anticipation of the courses to come. Each place setting had a copy of the tasting menu, so we could see what was coming next. It’s also very useful when you’re writing a recap of the evening later in the week. 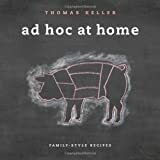 Shifting gears into more assertive flavors, the kitchen delivered this trio that introduces and demonstrates the proficiency of Talula’s Table with respect to terrines, pates, and game meats. Almost a counterpoint to the smooth texture of many pates, this terrine was rough and earthy with a hearty and intense flavor that evoked country farmhouse-style dishes. The cranberry sauce was intensely sweet, the flavor of the fruit condensed into a powerful core, and the duck confit – a small mound of shredded meat – at first seemed to be a stingily tiny portion until your palate realizes the depth and richness of everything in this course. On the whole, the components of this course combined well to evoke the warm feelings of a holiday meal, with rich game meats and sweet accompaniments. For the fourth course, the kitchen returned to seafood, but in an entirely different manner from the fluke that started the evening. Where the fluke was a delicate, flaky fish, the black grouper was a nice firm chunk of marine goodness, annointed with a light broth, dried strips of nori, and served over some of the most perfect carrots I’ve tasted – lightly glazed, but not overly so, tender, but not overly so, allowing the fresh flavor of the vegetable to take center stage. Now we come to what I personally believe to be the star course of the evening. 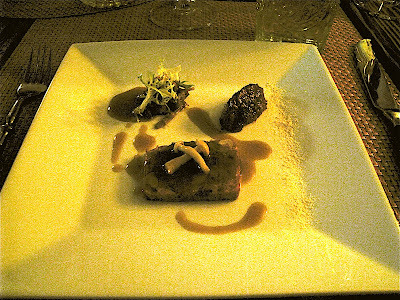 The fifth course showcased bison in two different ways, offering contrasts in preparation and texture. Bison is quite similar to beef in its taste, but less heavy, and with sweet undertones, and not at all gamy as some would suspect. The tenderloin here presented bison in its pure glory, a medallion of fork-tender meat that was more delicate than filet mignon, yet sturdier and more flavorful than a piece of well-stewed short rib. 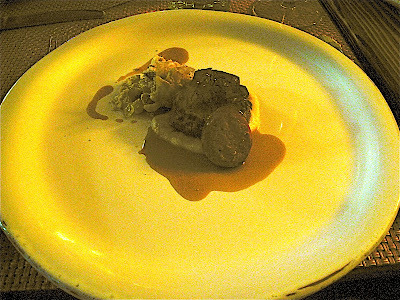 By comparison, the bison sausage was firm and assertive, offering a chance to experience the bison paired with other flavors and spices in another medium. The spaetzle, by its nature a very bland accompaniment, was brought up a level by the addition of the tangy horseradish sauce – I was anticipating the typical horseradish kick and was pleasantly surprised to discover a much more subtle accent. I could eat this every night and never get tired of it. This is my desert island food. Having leveled off and firmly cruising along with the more succulent game meats and rich sauces, the kitchen introduced the sixth course. This course again demonstrated the pairing of components that bring a spark to what is otherwise a typically bland accompaniment, risotto. The quail here, a small bird about the size of a tennis ball, was shredded to allow each diner to combine the meat with the risotto, save for a small leg bone that we were encouraged to eat with our fingers. 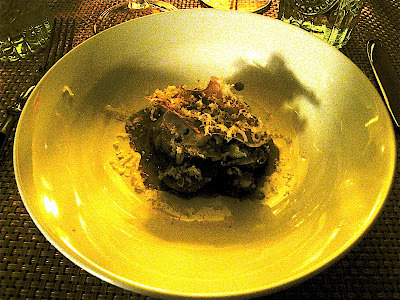 Quail is a dark meat game bird, and as such, the flavor of the meat was reminiscent of duck, but with less fat. Culatello is a distinct part of a prosciutto cut, seasoned, salted, and left to age for the better part of a year. The result, presented here, is a sliver of uber-prosciutto, a salty counterpoint to the risotto whose aftertaste pairs elegantly with the quail. If Talula’s Table carries the culatello as a regular marketplace item, it’s going on my next shopping list for sure. The crunch of the sauteed brussels sprouts provided a good textural contrast to the creaminess of the rest of the plate. 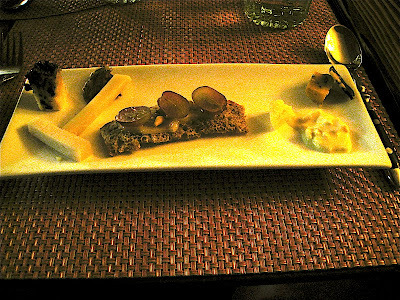 The seventh course consisted of a grouping of aged cheeses, ranging from mild goat’s milk all the way to a runny, creamy, robust St. Marcellin that made me think of the phrase “meadow oyster”. As has been the case with Aimee Olexy’s cheese selections, the cheeses started out mild on the left and became increasingly challenging as you progressed to the right. There was something for everyone’s palate, but I would think that the St. Marcellin would count for bonus points. The eighth and final course was, of course, chocolate. Glorious, melted chocolate. 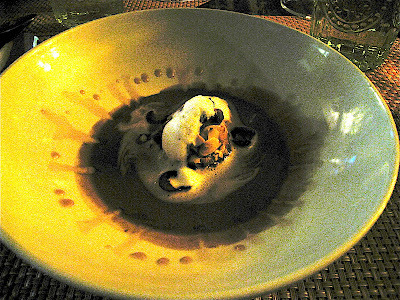 There’s nothing quite like a bowl of melted chocolate to bring a meal to an end, and this was exactly what the eighth course represented. The soup was warm and thin, and only slightly sweet, with additional sugar contributed by the cherries and a nice crunch provided by the almond financier strategically placed in the center of the bowl and topped with foam. The evening ended with the presentation of chocolate truffles, and a basket of housemade scones to take home (a nifty way, also, of delivering the check). We gathered our coats, and there were hugs and handshakes and promises to see each other soon, and in short order we were driving through the dark woods again, this time at a much less frenzied pace. After all of this, I think I’ve finally figured out what makes dinner at Talula’s Table so compelling. It’s not solely the food, as masterfully prepared as it is and as creative as the seasonal menu becomes with Bryan Sikora at the helm in the kitchen. It’s not the fact that you have to make reservations one year in advance of the date that you actually want to eat there, although this one fact is probably a compelling enough reason for many faux foodie hipsters – you know, the ones that have ten varieties of sea salt in their pantry, but who never cook, and who would probably buy a clod of dirt if they were told that it was artisanal volcanic soil from a small half acre plot on the vanishing shores of an exotic land. No, it’s definitely not that. It’s more than any one factor. After experiencing firsthand the Talula’s Table Farmhouse Table dinner with my wife and twelve other culinary companions, I’ve come to realize that the thing that truly makes dinner at Talula’s so magical is the rare synergy that emerges between the cuisine and the people, both in the kitchen and at the table, between each diner and each course, each server, the chef, and the hostess. If it were just a dozen people sitting in the same room eating together, Talula’s Table would be a clone of every BYOB bistro in every metropolitan area in the country. Instead, it’s much more than that. Talula’s Table fosters that uncommon sense of togetherness that’s rapidly fading away in the pace and stress of daily modern living. It’s four hours of putting life on pause, enjoying food and wine and company without distraction. We were sitting across from three people whom I had never met, and who had never heard of us prior to a week ago, and by the end of the evening, without knowing much of anything about their lives, their views, or their backgrounds, we could sincerely count them among our friends that we would gladly welcome into our home at anytime. Talula’s Table has that kind of energy, and it’s not something that’s easily copied. Bryan Sikora and Aimee Olexy have continued their unique approach, started years ago at Django, of making every meal a personal experience, one where the dishes actually seem to taste better because the people behind it have a genuine desire to make you happy.